The Daily Prompt ~~ The Whole Family had been cursed since…. The whole family had been cursed since twin sisters Calista and Cassandra ate the radioactive Chia seeds. 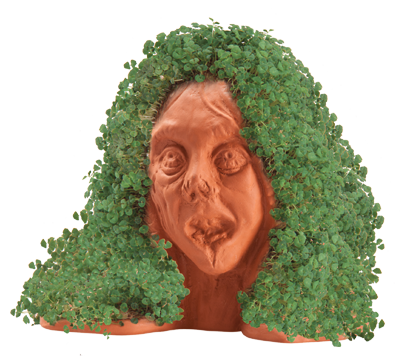 Not too long afterwards Chia pets began to take root in their wombs with developing Chia baby monsters growing and getting stronger day by day. As time passed along with the developing fetuses they began sprouting greenery from their ears, nose, mouth, pores and even their lady parts. Within a scant 6 months both sisters gave birth to baby chia monstrosities. The townsfolk in their distrust and horror made their way through the bayous, swamps, and bogs teeming with life attempting to chase down and stab, shoot with a silver bullet, hack to death and dismember both Calista and Cassandra along with their respective Chia children. As this Chia-lite family ran for their lives they deposited Chia seeds into the fertile unconsecrated ground springing up to entangle and strangle the Sheriff, his deputies as well as nearly all the rampaging villagers with their torch lamps and Blast-master 5000’s. As the moon rose full upon that starry night so did Chia Zombies which ripped fleeing flesh from juicy marrow bones, snapping, popping and crunching with glee over each gory mouthful. Chia Zombies are not brainless wonders like film or TV zombies not only did they feast upon human flesh but made their way to the local gardeners, hot house, and nature museum where in their zest and haste to grow and be powerful they consumed large amounts of miracle grow and any other type plant food they could find turning themselves into Avenging Green Warriors for Mother Nature stamping all doubters of Global Warming and Climate Change. The Mother and Twin Reunions also ate enormous amounts of Kudzu, which is the mother of all climbing, coiling, and trailing perennial vines. This increase their ability to spread unhindered into neighboring towns, villages, and provinces. Calista and Cassandra embodying the supremacies and strengths of human and plant life became female oracles declaring the redemptive power of Gaia causing flora and fauna to bow down to the Alfalfa and the Omega…………………………………………………………. Well our family has had bad luck every since with cousins Morton and Milton the next set to endure the curse, but that tale is for another post. See ya!! Thank you! I try to allow my imagination to just go wild!! LOL!! Please send as much sunshine and warmth as you can. It is negative 2 degrees blustery, icy, windy and freezing in New York. The Big Apple is frozen solid. Love this! Thank you for sharing it!